Have you ever read one of those negative reviews about EVE on Steam? A lot of them are probably written by Venture pilots. Agent Minx Mattel introduced Commander Hodenkobold to the concept of elite PvP. The miner immediately played the newbie card and threatened to quit the game. Back when I was a new player, people didn't act like this when they lost a ship. But it seems to be very, very common now. What could account for this cultural shift? And yes, it's a safe bet that CCP knows about our mining permits. Though he'd only been playing for three days, Commander Hodenkobold was fully versed in all the carebear arguments about player retention, subscriber numbers, and the rest of it. We're seeing this sort of thing a lot these days. Something strange is afoot in highsec. With one final passive-aggressive whine about new players, Commander Hodenkobold terminated the convo. But he wasn't finished yet. Still angry about the loss of his Venture, the miner began posting bulletins about Agent Minx in local chat. Instead of sending a negative review to Steam, Commander Hodenkobold was writing negative reviews in local about the Agent who ganked him. It was the only form of revenge the miner would consider. Engaging in spaceship combat--in a spaceship combat game--was out of the question. He wouldn't stoop to that level. Previously, the miner had expressed much concern about CCP's subscription revenues. But if he couldn't enjoy his Venture in total safety, then he'd rather see every new player quit the game. 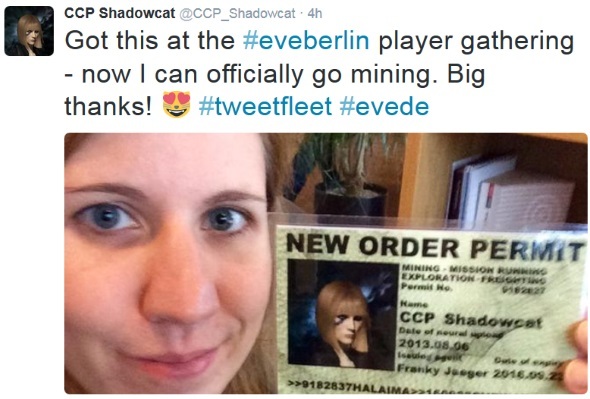 This greedy little miner threw CCP under the bus! There was no reasoning with Commander Hodenkobold. Anyone who dared shoot a miner in highsec was deemed less than human. In a few weeks, the former highsec miner was engaging in PvP with Pandemic Legion in nullsec. If it hadn't been for Agent Minx and the Code, Commander Hodenkobold would still be AFK mining highsec ore in a Venture--if he didn't quit the game out of boredom. Sounds like the Code was the best thing that ever happened to him, no? And the permit in that picture is expired. Welcome to Eve, buckle up kiddo. It must be in their carebear DNA, whatever makes them act like that. Maybe that extra set of chromosomes. Lol did you think I would forget? There's an unfulfilled promise there, but what can you expect from a highsec miner. Tsk tsk, another carebear shitter making fantastical claims in a feeble attempt to bolster his braggadocious narrative. The reality is that he's a highsec shitter by nature, trying to hide from the fact that he got caught in yet another carebear lie. Watch his carebear's friends shed some grade A tears over this comment, without ever addressing the fact that altshitter lied to further a false narrative. Not a single set of balls among the lot. Proof or gtfo, shitters. IRL of course. Lying trash, his kind don't belond in CODE. alliance. Agreed, it's a shame when the legacy of ganking giants like loyal and D400 is left to the likes of highsec carebears like alt 00. I do find it suspicious that alt 00 has still not backed up her claims on this. It is unlike that carebear not to be very vocal, and quick to try and correct others.